This cute blue robot has been heralded as one of the best STEM toys out there, and it’s easy to see why! 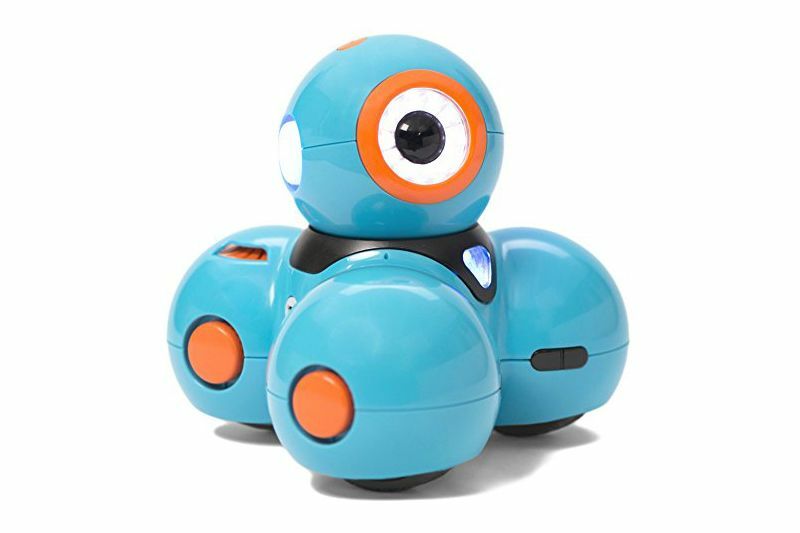 The Wonder Workshop Dash Robot teaches kids ages 6 and up how to code, all while singing, dancing, playing, and having tons of fun. Dash connects to a free app where kids can teach their robot all sorts of tricks, from lighting up to avoiding obstacles and even responding to voice commands. The app includes hundreds of puzzles and projects, so you can rest assured kids won’t get tired of Dash any time soon. If you think it sounds too complicated, don’t worry—the app includes tutorials to teach children the fundamentals of coding and how to program the robot. Dash’s educational value and limitless fun earned it the Oppenheim Best Toy Award in 2016, and it’s one of our top picks for electronic toys this year. Read more reviews of the best robot toys available to purchase online. These are just like the toy cars you used to play with—but with a lot more fancy technology! 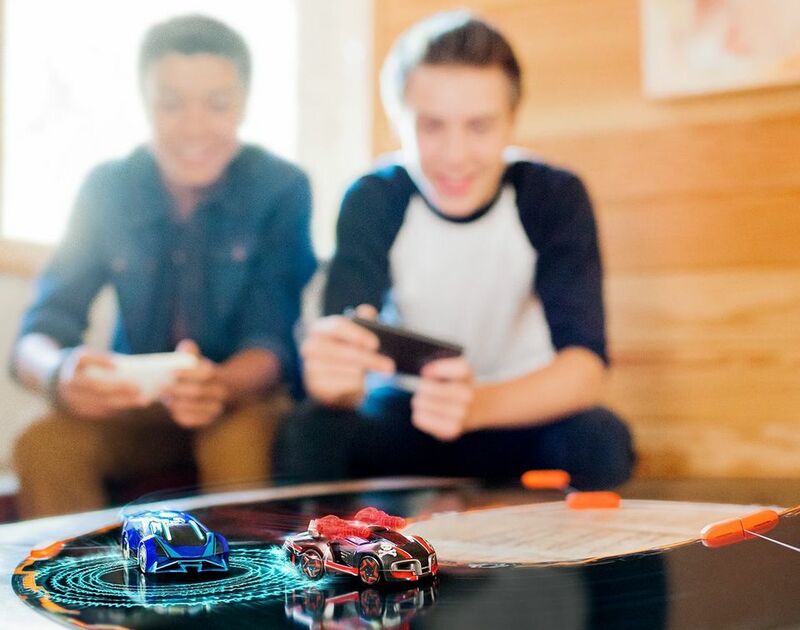 The Anki Overdrive Kit lets kids control robotic “supercars” from their phones, racing the vehicles around the track and battling each other with plasma cannons and other high-tech weapons. The Starter Kit comes with two supercars and 12 track pieces that snap together to create a variety of race tracks. Children can battle it out with friends, each controlling a car, or play on their own, racing against an artificial intelligence–controlled vehicle. There are several different play settings, including Battle, Race, and Time Trial, and the app includes frequent software updates to keep gameplay fresh and exciting. With so many cool features, this high-tech racing kit will provides hours of entertainment for the whole family! It may just look like a happy little caterpillar, but the Fisher-Price Think & Learn Code-a-Pillar Toy is much more. This critter is a puzzle waiting to be solved, as its nine switchable segments control the caterpillar’s movements. Want the Code-a-Pillar to go straight, then turn left? Arrange the segments in that order, then watch it come to life! This electronic toy is great for young children developing critical thinking skills, as they can experiment with different sequences to create new paths for the Code-a-Pillar. As kids get the hang of it, they can create new games, such as drawing paths for the bug to follow or specifying an endpoint for it to reach. The possibilities are endless, which means this toy will continue challenging kids for years to come. If your children are always borrowing your phone or camera to take pictures, this toy is a must-have. The VTech Kidizoom Camera Pix is a durable digital camera designed for kids ages 3 to 8, and it makes a great gift for all the budding artists out there. The Kidizoom Camera is a real digital camera that stores photos on an SD memory card (not included). In addition to standard features like zoom, this gadget comes with a selfie mode, collage templates, photo effects, and several built-in games. And because it’s designed for little hands, the camera is plenty durable and can withstand being dropped. If you’re looking for a toy that will foster creativity and keep children occupied for hours, the Kidizoom Camera certainly fits the bill! If you have a young Star Wars fan in the family, there’s no better gift than the Sphero Star Wars BB-8 Droid, a cute app-controlled replica of the droid from The Force Awakens. Kids will have a great time guiding BB-8 around the house, giving him voice commands and recording holographic messages. The Star Wars robot can be driven through an app on your smartphone or tablet, but it does much more than travel around. BB-8 has an adaptive personality, so its attitude changes as kids play with it, and the little droid can also explore on its own—just set it to “Patrol” mode and watch as it navigates the surrounding area. As if that wasn’t cool enough, BB-8 also loves to watch the Star Wars movies. Select the “Watch With Me” option, and BB-8 will watch Rogue One and The Force Awakens with you, reacting to different scenes in the films. This robot is more than a toy—it’s a companion! Zoomer Kitty is sure to put a smile on the face of any child! This sweet robotic cat is designed to act just like a real kitty, playing, purring, cuddling, and much more. Young animal lovers won’t want to put down Zoomer Kitty, which is designed for children between 5 and 7 years old. In “Play Mode,” the Kitty will sing, dance, do tricks, and chase her toy, following your movements with her eyes. You can then switch to “Cuddle Mode,” where she’ll nuzzle up to you and purr as you stroke her head. Finally, there’s “Pounce Mode,” which sets Kitty on the prowl, jumping after imaginary prey. With Zoomer Kitty’s life-like actions and adorable antics, it’s like having a real cat—without any of the scratches. Amazon recently released a Fire Tablet specially designed for children, and it’s sure to be one of the hottest gifts of the year. The Fire 7 Kids Edition Tablet has a 7-inch screen surrounded by a kid-proof case, and perhaps best of all, Amazon is offering a two-year guarantee on the tablet with no questions asked. The Kids Edition Tablet is a real tablet with eight hours of battery life, but it was designed for the rough-and-tumble lifestyle of children. The Fire 7 Kids Edition is recommended for children ages 3 and up, and it comes loaded with one free year of Freetime Unlimited, which lets kids access age-appropriate games, apps, and videos from sites like PBS, Disney, and more. The tablet comes with built-in parental controls that can limit screen time and filter out inappropriate content, but one of the biggest selling points for this tablet over other options is Amazon’s two-year guarantee. If your kids break the Fire 7 Kids Edition, simply return it and Amazon will replace it. No questions asked! This adorable toy dump truck has rave reviews from users, so you know it will be a great gift for kids age 6 months to 3 years. The VTech Drop and Go Dump Truck is equal parts fun and educational, and its colorful design and fun melodies will keep toddlers captivated. What makes it so entertaining? The Drop and Go Dump Truck will count its three bright boulders as toddlers put each one into the toy, and it’s easy to dump them back out again with the pull of a lever. Kids can pull the truck around the house using the attached string, and there are several buttons on the vehicle that play melodies and phrases to help toddlers learn about colors and tools. Another added bonus is that you can turn down the volume if you get tired of listening to the same sounds again and again—it’s the little things! Let your kids’ imagination take flight with the GoolRC T36 Mini RC Quadcopter Drone. This 3-inch drone is heralded as a great option for beginners thanks to its stable flight system, which makes it easy for kids to learn to fly. The Mini RC Quadcopter Drone is small enough to fly in the house, but it can be controlled from up to 30 meters away, making it a fun outdoor toy too. Fly the drone up and down, forward and back with the touch of a button, and once kids get the hang of things, they can try out some impressive tricks, such as in-air flips! One downside of this mini drone is that you only get around five minutes of flight time, so kids will have to recharge if they want to play for longer. However, the reasonable price and easy-to-learn controls make the Mini RC Quadcopter Drone a great starter toy for novice flyers. Remember how much fun you used to have running around with walkie talkies when you were little? Well, these classic toys provide just as much enjoyment to kids today. The Retevis RT628 Kids Walkie Talkies make a great gift for children 3 and up, letting them play secret agent, explorers, and as many other games as they can dream up. These walkie talkies from Retevis are easy to use and small enough for little hands to carry. They have a range of upward of 3,000 feet and include 22 different channels, but you can lock the channel for younger children so they don’t accidentally change it. You’ll get two walkie talkies from the seller, but it’s easy to add more receivers if your kids want to play with their friends or if you want to keep tabs on what they’re doing. We bought a top-rated electronic toy that our reviewers tested for five hours. We asked our testers to consider the most important features when using this toy, from the skills involved to its price and durability. We’ve outlined the key takeaways here so that you, too, know what to look for when shopping. Skills Electronic toys are a great way to teach kids important skills while they’re having fun. From those for young kids that teach letters and numbers to more sophisticated robots and other toys that help older kids learn to code, they can help turn playtime into so much more. Consider the age, attention span, and starting skill level of the kids before choosing one. Durability When it comes to electronic toys, you want those that will hold up well for hours of play. You also want to consider how they’re powered, including how many batteries they need, how long it takes to charge them, and how long they last between charges. Price Electronic toys often feature a ton of impressive technology, which can come with a hefty price tag. They don’t have to, though. There are a wide variety of electronic toys in all price ranges. To choose the best ones for the kids in your life, consider how versatile a toy is, how many years they’ll likely be able to use it, and, of course, your budget.